At Titan Tree Care we bring professional and knowledgeable tree service to several areas in the North Metro Phoenix Area. Titan Tree Care has two Certified Arborists on staff and over 50 years of tree health experience. Our staff works with the best, state of the art equipment and will tailor the most comprehensive solution for your trees. Whether you need trees removed, planted, pruned, or just fertilized, Titan Tree Care is your local tree expert. We got this. Very thorough and efficient. Asked if I was satisfied with the end result and took the time to answer questions and explain follow up. Everything was done professionally and on time. The crew was well informed on the agreement we had and conducted themselves in a polite and courteous manner. There were no surprises in the agreed upon price as well. Landscape team was professional and completed work as required. Titan does a great job every time! The finished product is great! We had a little hic-up, but Aaron took immediate corrective action and all is well. Looking forward to seeing how our landscape and trees respond to Titan's Landscape and Tree Care. Great service from friendly personnel. The crew did an excellent job on a 40 to 50 foot tree - superb clean up. The crew was on time, they were quick and left the place cleaner then when they arrived. Great job! Great guys and I am very pleased to see they had helmets as protective gear. Of course, new equipment is good to see but all in all, it was good that it was obvious your staff knew what they were doing. Aaron was patient with our hesitation, and offered good advise. Thank you. Excellent customer service! From the coordinator who performs the scheduling and customer follow-up, to the personnel working out in the heat of the day, everyone seems very professional and considerate. It was easy to see they wanted to ensure I was a satisfied customer! Thank you for the great review, Rob!! They have great customer service and are very knowledgeable. We appreciate the feedback, Melody & Bryan! Very responsive / Did a great job / Cleaned up well afterwards / Affordable price. I am very pleased with all aspects of my interaction with Titan from the office staff to the individuals who performed the job. They really understand the concept of service. In addition, their estimate was significantly less than that of another company. I have already recommended Titan to other potential clients. We appreciate you, Linda!! Thank you so much! This was our first time to use your tree service. Your service was very timely and efficient. You removed one tree and trimmed the others in a very professional manner. We feel comfortable that the trees are prepared for the current monsoon season. Thank you for the review, Mary! The guys did an amazing job working around the existing plant material as they removed several large trees and trimmed others. Very happy with the work that was performed. 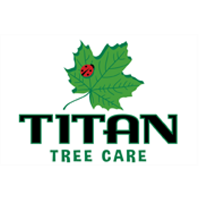 Titan does our pest control and now will be our go to for tree care. Not all branches were picked up from the property. Some tree ties were cut and left on the ground. Homeowner was not notified that the tied were cut and not put back or the reason they were cut or removed. We appreciate the feedback, Irena! Our Tree Care Manager, Cliah, will be in touch with you shortly. 4 man crew ended up showing up and took care of the huge tree in no time. thanks for the quick and efficient service that we got. Thank you for the review, Jessica! Yes - we are happy with your service of our trees. Thank you for the review, Tom! Excellent customer service! Easy to schedule, came out promptly to do the estimate, and then do the work. Followed up with a phone call to make sure all was well. Probably the easiest service I've ever requested/received. Oh and of course, the tree looks great and I trust that an arborist took care of it! Thanks! I definitely recommend Titan Tree Care! We appreciate you, Veronnica! Thank you! On time and job was completed to our satisfaction. We would highly recommend the company. Friendly crew - reviewed job - got right to work - did what had to be done and cleaned up afterwards. No surprises! We appreciate the feedback, Richard!! Great crew chief and terrific crew. First class all the way. Trees look great and the yard was kept impeccable. Wouldn’t think of using anyone else. We appreciate the feedback, Marc!! Thank you for taking great care of our new tree and getting it started in these first few years of growth! Thank you for the review, Dennis! David came out and did an assesment. He was helpful, answered questions and went over pricing options. The crew was on time, respectful and did the job right. Thank you for the review, Amber! Fast, cleaned up perfectly, workers were polite and very accommodating. I was very well pleased and would recommend them.!! Thank you for the great feedback Denise!! We'll pass this along to our guys! Arrived on time. Very efficient and cleaned up. We were impressed and have already recommended them. You're awesome! Thank you, Carol! Reliable, professional and competitively priced. Highly recommend Titan. I would definitely recommend Titan Tree Care. What a fantastic company to deal with. From the lady in the office to the Arborist who came out to the professional five man crew who trimmed our huge Ironwood, they were wonderful. They took care of business, chipper was quiet, and crew was non-intrusive. They even showed up early and cleaned everything up. Our tree looks beautiful! A job well done. Will use you again. Thank you. All looks great and did a good job of cleaning up. Easy to do business with and quality effort and results - very knowledgable, reasonable pricing and good communication. Office staff is excellent. Very pleased with the service. Will use Titan again. Quick and cleaned up after removal. Very pleased. I have had two great experiences with Titan Tree service. They were professional and provided up front estimates. Thank you. Victor and crew did a splendid job. trees look great and clean up was spectacular. Amazing work!! Fast, efficient, safe and friendly! Did excellent job removing trees.